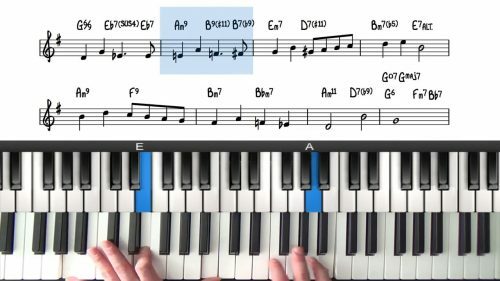 This is the second lesson in the series on learning to harmonise the melody of jazz standards. In the first lesson we looked at harmonising the melody note of major chords and in this lesson we are going to focus on minor chords and focus on the different voicings that can be used under each of the 7 notes of the Dorian scale. 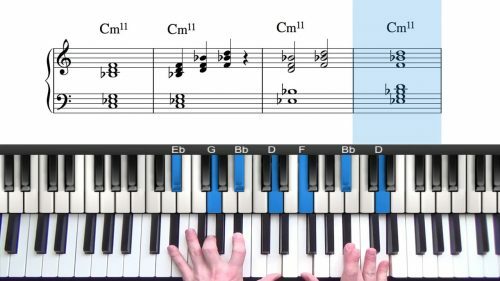 The majority of the time, the melody over minor chords will be one of these 7 notes so if you memorise formulas for harmonising these melody notes, you will always be able to find a rich and interesting sounding voicing for minor chords in all 12 keys. Every time you come across a chord on a lead sheet, you should analyse the scale degree of the melody in relation to the chord underneath. Making a conscious analysis of this when you are playing through jazz standards will help you memorise and internalise voicings. This is really important! By ‘internalise’ I mean remember the formula. With jazz it is far more efficient to think in terms of numbers (or scale degrees) than to think of individual notes.